Japan Ice EP by Rush? Release 023 matches newbies, Rush?, with Dutch maestro, Gerd. Alfredo Caforio and Gianni Sabato came together with equal, yet different musical ideas, to form Rush?. What began as fun sessions and club nights throughout Italy, eventually saw the pair developing their own sound and before long music. They describe their work as, “full of atmospheric detail, sometimes a little abstract and sometimes more narrative, but always with deep club-based grooves”. 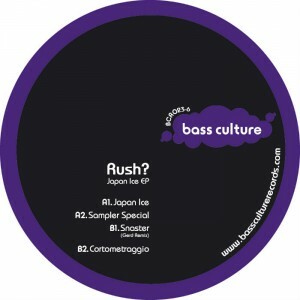 The Japan Ice EP features four original cuts from the duo, all revelling in the raw oldschool sound that Rush? hold so dear. Yet whilst the influence of Detroit rings loud, this is most certainly an EP for the present. Gerd ramps things up on his rework of “Snaster“, building to a crescendo before dropping into a ravey bassline that veers brilliantly from smooth to distorted to acidic and back again. This entry was posted on March 28, 2012 at 16:40 and is filed under Release.